What Causes Low Potassium or potassium deficiency is a combination of factors. The main causes of low potassium are actually pretty simple- and fairly obvious - but there is one surprising fact about what causes low potassium that I'll bet that you didn't know about. Many people, even young and seemingly healthy people, have mild potassium deficiency- yet most don't show any symptoms or have any problems- at least not obvious ones that doctors relate to low potassium levels. But people with heart problems and those who are ill very often have potassium deficiencies that can cause heart rhythm abnormalities, cramps and other problems. But most of these problems could have been avoided by avoiding the causes of low potassium that will be outlined below. 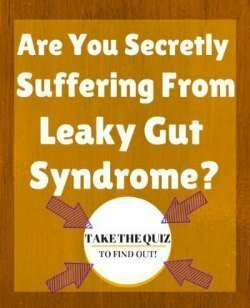 Are all the same as Signs of Magnesium Deficiency as well! So, many of the signs of potassium deficiency are actually signs of MAGNESIUM deficiency- and NOT actually caused from the potassium at all! In fact, potassium and magnesium are SO closely linked that in some studies, they were actually able to give those with potassium deficiency a Normal Potassium Level by only giving MAGNESIUM. While that doesn't seem to make any sense, on the Magnesium Facts page, you'll see that magnesium is a 'master nutrient' that is responsible for the ability of many other nutrients to be absorbed as well. Other studies have found that people with chronically low potassium levels were FINALLY able to maintain their potassium levels ONLYafter their magnesium was replaced!! It might make you wonder why they didn't replace the magnesium in the first place. Well, blood Magnesium Levels are completely inaccurate and miss almost 90% of magnesium deficiencies. 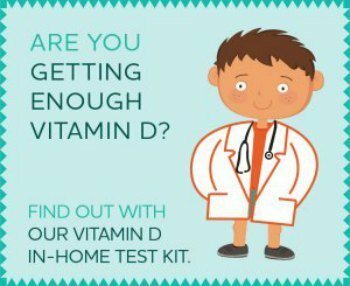 Yet doctors rely on these tests completely in order to determine whether to give magnesium or not. So most magnesium deficiencies end up getting missed while those with potassium deficiency suffer and their issues often become 'chronic' problems. As long as there are no metabolic or digestive problems present, the most common problem that causes low potassium is simply not getting enough in foods. Since potassium is a water soluble vitamin and gets excreted into the urine and stool, you must get potassium every single day in your food in order to meet your needs. Most people (including doctors) take it for granted that you are able to meet all of your nutrient needs in food. But the vast majority of people eat few fresh fruits and vegetables and they are the main food sources of potassium. If you are not eating enough fruits and vegetables, then it's very likely that you are not getting enough potassium OR magnesium -and this is What Causes Low Potassium in most people eating highly refined 'Western' diets. If this sounds like you, then consider changing to a diet with whole, organic foods such as outlined in The Healthy Urban Kitchen . Few doctors are concerned about potassium levels due to prescription drug usage unless they are taking diuretic 'water pills'. But this is a VERY real problem with many drugs that may be responsible for the Side Effects such as weakness, muscle cramps, and other problems that can be especially devastating to the elderly who may end up unnecessarily being hospitalized or even falling and breaking bones from these preventable side effects! Many people who drink sodas often drink multiple sodas on a daily basis, but this could be what causes low potassium levels- especially in younger people. Drinking large amounts of soda and other sugary drinks can also deplete potassium in two ways. The first way is that the sugary sodas themselves cause you to lose potassium. The second is that the empty calories fill you up and don't leave room for nutrient-dense foods that DO contain magnesium and potassium. This could be leading to the all too common problem of sudden death in young and healthy athletes. This is often caused from a heart condition called Prolonged QT Interval. These athletes, who often drink sugar laden 'sports' drinks or sodas that contain almost no potassium OR magnesium, end up depleting these vital nutrients while exercising- which can end up being deadly. Even sodas with artificial sweeteners can be one of the Causes of Heart Palpitations!! So, the moral is that there is just simply no place for soda of any kind in the diet of ANYONE- except on a very rare basis. Breaking the soda habit, if you have one, is probably one of the absolute best health maintaining habits you can make. Digestive issues are a big cause of low potassium and magnesium levels. There are two ways that digestive issues can cause electrolyte imbalances. The first way is through losses such as diarrhea and vomiting where the potassium is lost in the body fluid losses. This one is quite obvious and usually no one who has a severe case of 'food poisoning' is surprised to find out about an electrolyte imbalance from one of these.. ahem... uncomfortable problems. But those with CHRONIC digestive losses to loose stools, such as in cases of Crohn's Disease or irritable bowel syndrome, will very often find that this causes low potassium on a chronic basis and have difficulty keeping their electrolyte levels up. The other digestive problem that causes low potassium is usually more subtle and harder to figure out. Poor absorption of nutrients is not always such an obvious problem, but people with chronic fatigue, weakness and Symptoms of Fibromyalgia may simply have problems absorbing multiple nutrients. One of the problems that is frequently overlooked in these cases isGluten Sensitivity which can lead to a condition called Increased Intestinal Permeability that prevents the absorption of nutrients. Then you should consider that you may very well have digestive malabsorption issues and that may be what is Causing Low Potassium in your case. 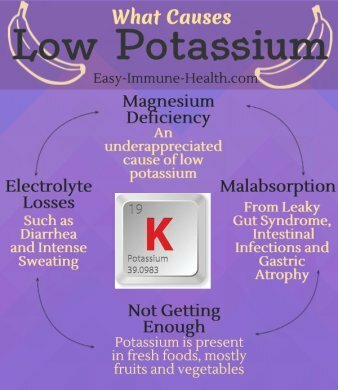 There are actually only a few reasons for low potassium levels, so consider this page carefully when you are trying to determine why you are having these problems.